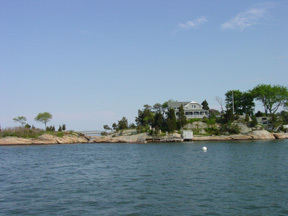 This archipelago SE of Branford, CT is a collection of steep granite "islands" sticking out of deep water, bearing rocky ledges and a few impressive houses hiding among tall pines. They are thought to have been swept off Maine and carried by the glacier to their current location. Even more fascinating is the unique architecture of some of the homes here, built on top of the rocky outcroppings, many on stilts bearing platform foundations! A few bear footbridges across precipices that lead to docks snuggled in stone alcoves. Be sure to take a careful cruise around while you’re there.There is a humble New England fishing village on one of the islands. 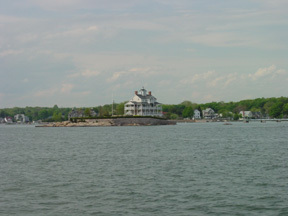 On the mainland, Stoney Creek is a charming village that is really a part of Branford. 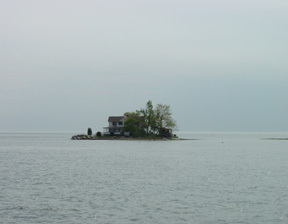 Although the islands are mostly a seasonal community and the last occupants leave by early to mid-November, Stoney Creek has about 2500 year-round residents. 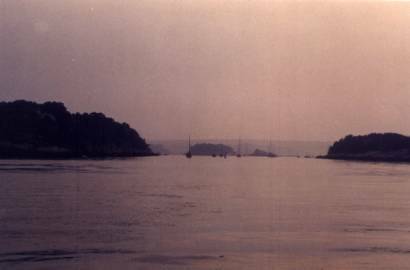 There are several anchorages, but they are not easy to find without local knowledge and excellent charts. 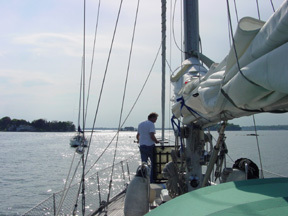 Approaching the anchorages can be disorienting at first, but if you locate Outer Island by the ruin of a chimney on it, you can line up the channel that passes between Pot Island and High Island, the main anchorage and by far the easiest to negotiate. Use a detailed chart, as rocks and underwater ledges are clustered around the approaches that lead into the main "Chamber" and steer clear of the green buoy which marks a depth of only 3 feet. The ledges are generally steep and well marked but unlit, and the depth ranges from 15 feet off Pot Island to 11 feet farther in near Money Island. 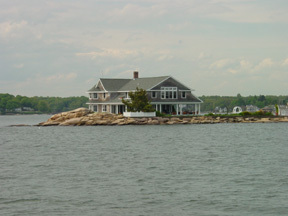 Most of the Islands are privately owned, and Outer Island is a nature preserve. The maze of islands can be confusing in limited light if it is your first (even second or fifth) time. Tidal currents swirl in the main anchoring chamber and through many of the cuts, so make sure you have plenty of swinging room. The Coast Guard mooring is free for the taking if it's unoccupied by CG vessels by nightfall. Of course if a CG vessel does arrive, you'll have to vacate the mooring. 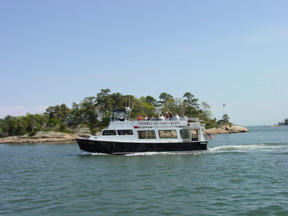 Be aware that a small tour boat ferries passengers around the islands in the summer. Many of the power boats leave for the night which leaves much more room than you might imagine. 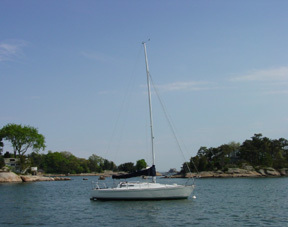 A second anchorage off Cut-in-Two Island is much trickier to reach because it is unmarked, littered with rocks that lurk below the surface, and host to strong currents. I would not attempt it under questionable conditions without local knowledge. It is, however, a good anchorage and closer to Stoney Creek. It's best early and late in the season when there are likely to be fewer boats. 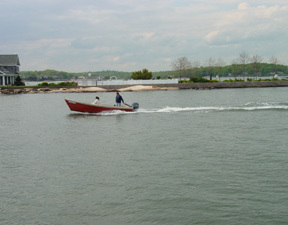 Stony Creek has a substantial dinghy dock to service the many residents who live on the islands in the summer. Part of it is private with gated access. There is a fuel dock with full access to the main street, and this is where we parked our dinghy when going ashore to meet friends for dinner. At 7:00 pm, there was no one in evidence at the dock area at all but us on Memorial Day weekend. 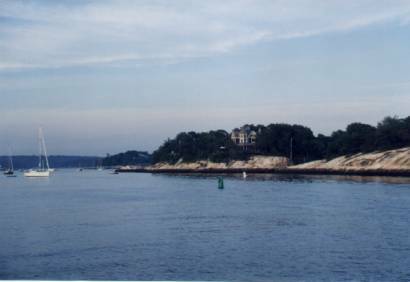 The Thimble Islands are one of our favorite destinations on Long Island Sound and one of the prime locations where Captain Kidd’s treasure is supposed to be buried, although it doesn’t seem likely anyone could bury much of anything here given the rocky nature of the islands. Aptly-named Money Island has probably been dug up many times over through the years. In the height of summer, there will be boats everywhere, power and sail, with small classic daysailors weaving their way expertly through the crowd. There is a tour ferry, one of three docked in Stony Creek that makes the trip around the island and points out legends and famous residents. 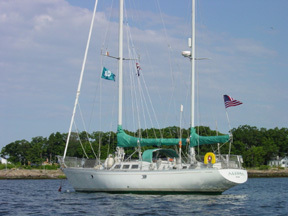 You can hear stories and gossip from the Captain and tour guide. 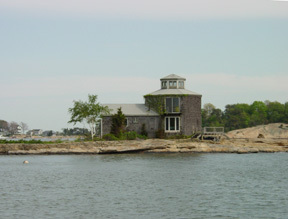 For example, the name Thimble comes from a thimble-like berry, there are about two dozen inhabited islands, and Jane Pauley and "Doonesbury's" Trudeau have homes on Governor Island. Better yet was hearing that Mother-in-Law Island was named for the woman who disturbed her daughter's wedding night and that General Tom Thumb courted Miss Emily here. She was the petite daughter of a Thimble homeowner on "Cut-in-Two Island" during the 1860's, but PT Barnum wouldn't allow them to be married. You can get more information at the delightful website http://thimbleislands.com/.